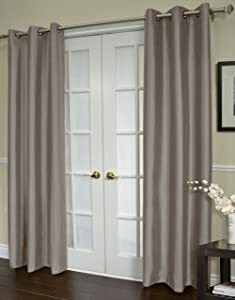 At first glance it may be simply a standard curtain panels. However, this Shantung Thermal Grommet 2-Pack is built for special function. Brought to you by Residence, a popular curtains or drapes provider over the years, this Faux Silk Thermal collection is one of its recent hits, in the colors of plum, walnut, wheat, stone, cappucino, steel blue, and viridian grey. So, what can this Shantung 2-Pack thermal grommet do for you? As a matter of fact, this Residence model, made of satin material, is mainly designed for saving you a lot of money on heating costs during the cold weather. These black-out panels are really energy efficient because they insulate efficiently your room from cold outside by thicker drapes with foam backing. More than that, it helps kill the light and eliminate the noise as well, which, as an extra bonus, prolongs the using life of your furniture, painting, and carpets by avoiding exposing them directly to the strong sun light. – Sold in pairs. It is easy to understand, isn’t it? One Response to "Residence Shantung Thermal Grommet 2-Pack"
I hope you can help me. I’m looking for Residence Brand Panels in the Printed MetallicTextured collection in the color Slate. I bought one pair of these panels at Homegoods at TJ MAXX. I need about 5 more pairs and I cannot find them anywhere! I have went to every Homegoods / TJ Maxx in Miami and they are nowhere to be found. By any chance, do you have a contact info for Residence or do you know who else sells that brand? I have been searching online and I can’t find anything.